“Do you like my bike?” the voice behind me asked. I cringed, my finger locked above the camera button. Recently I heard this very question while I was taking a photo of another bike, only to turn around to discover a stupefied glare from an open window. My mind goes back again to an article I read. 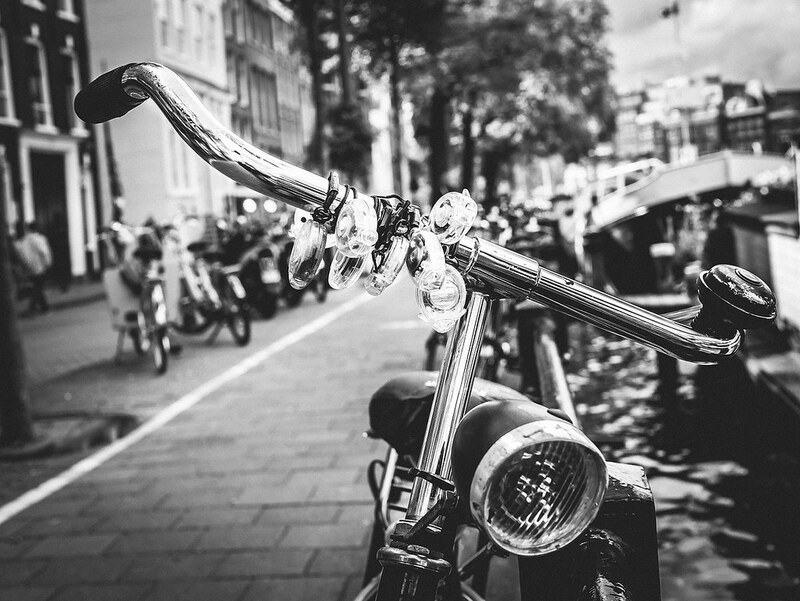 How someone can take a picture of a bike, jot down the spot and send it online to a bike thief in Amsterdam. For a small fee, the bandit will do the heist. I shuttered to think I could be associated with such a cardinal sin. “Um, yes…” I answered, straining to stand up from my squat. I spin around to find a girl with an inquisitive smile and agreeable eyes. I paused, scanning her pattern of facial piercings as I scrambled for something to say. “Oh, I like to collect them,” she said. “What an odd thing to collect,” I thought to myself, looking down at her bike. The lights hung like ornaments along the flat handlebar. My simple curious nature was perked, it was for this reason, I veered off the path to take a picture. I recognize them as being the cheap lights found at any dollar store that would make claim to have a bike accessories section. I know many of them have the lifespan of a worker bee, but wanted to ask anyway. “Yes, I test them before I take them,” she replied. “Take them from where?…” my thoughts began to stitch a foregone conclusion. Momentarily stunned by Dutch frankness of things, I became mindful of my head that was ever so slightly moving left to right in disapproval. I hope she didn’t notice, but she continued. “I’m going to collect more until this is full,” she said enthusiastically, sweeping her finger across the handlebar. She asked if I wanted to take more pictures of her bike. I happily nodded and shot a few more, postponing my last snap to count the lights. Eight. We said our goodbyes and I set off on my bike. I glanced down at the plastic bulb dangling from my handlebar. Pulling at it for a while as I rode, inspecting it between my fingers before I pinched the button to turn it on.